This omnibus edition, contains the short novels To Walk The Night (1937) and The Edge of Running Water (1939), the only long fiction output of forgotten author William Sloane (1906-1974). The reissue of these novels is long overdue, and cause for celebration. Despite their age, these stories are a breath of fresh air...remarkable works that casually ignore genre boundaries, allowing the stories to go where they must, moving from mystery, to science fiction, to horror with subtle ease. 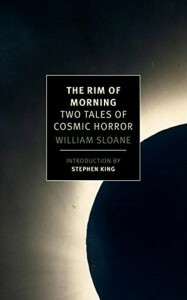 From the mysterious burning death of a college professor in To Walk The Night, to a widower's attempt to contact his late wife via an electric "seance" machine in The Edge of Running Water, Sloane tells his tales rationally, in a clear and concise prose style that is refreshingly accessible and vastly more chilling, with the kind of snappy, smart dialogue that has become so rare in fiction these days, just the right dash of humor and pacing that is damn near pitch perfect. The only downside is that these are the only novels Sloane ever wrote. Truly a shame. Highest possible recommendation for all fans of engaging, well written fiction.